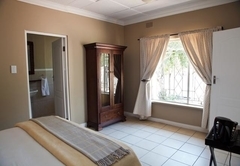 Stay-A-While Guest House is a highly recommended B&B with self catering option, providing accommodation in Edenvale for tourists visiting the East Rand region. 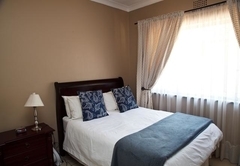 Stay-A-While Guest House offers self-catering or bed and breakfast suites, situated in a quiet residential suburb, within 10km of OR Tambo International Airport. Each suite has private access and secure parking and is set in lush green gardens with a swimming pool and prolific bird life. 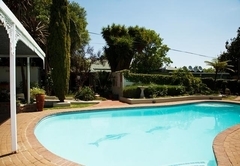 Stay-a-While guest house comprises of thirteen suites, set in secure gardens with off street undercover parking and a large swimming pool for those sunny Highveld days. 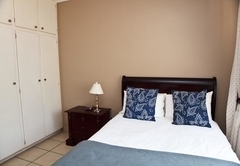 Our thirteen (one single room, nine double rooms and 3 family suites) well-appointed suites all have DStv, kitchens or kitchenettes, clock radios and en-suite bathrooms with showers and/or baths, with private access and off street parking for all guests. The gardens have prolific bird-life because of the indigenous trees and nests. Some of the regular birds (in their seasons) are starlings, black-collar barbets, Long-Billed Wood Hoepoe, Crested Barbet, Robin, African Go-away birds, Shrike, Mouse-Birds, African Hoepoe, Hadeda's and more. Breakfast needs to be pre-booked a day in advance. 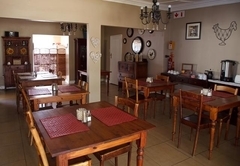 Breakfast is served on weekdays from 06h30 – 08h30 and weekends and public holidays from 08h00-09h30. Dinner only by prior arrangement. 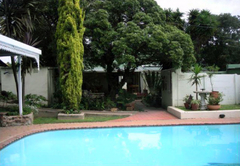 • Safe and secure well lit gardens with off street parking all behind electric fences. This suite sleeps 1 in a single bed. The bathroom has a shower. The suite has kitchen facilities (toaster, microwave, cutlery and fridge) and complementary tea and coffee is provided. 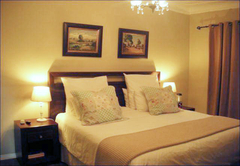 This suite sleeps 2 in a king bed or two single beds. The bathroom has a shower and a bath. 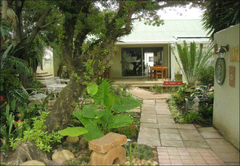 The suite has kitchen facilities (toaster, microwave, cutlery and fridge) and complementary tea and coffee is provided. This suite sleeps 2 in a king bed. The bathroom has a shower and a bath. The suite has a kettle and a fridge. There is a couch, DStv and a patio. 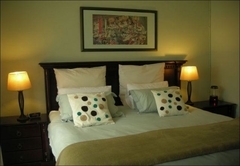 This suite sleeps 2 in a king bed or two single beds. The bathroom has a shower and a bath. 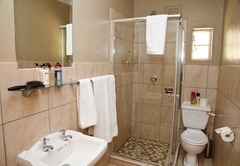 The suite has kitchen facilities (toaster, microwave, cutlery and fridge) and complementary tea and coffee. There is a couch, DStv and a patio. 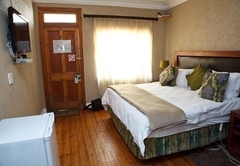 This suite sleeps 2 in a double bed. The bathroom has a shower and a bath. The suite has complementary tea/coffee, DStv and a patio. 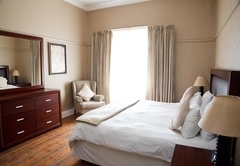 This suite sleeps 2 in a king bed or two single beds. The bathroom has a shower and a bath. The suite has kitchen facilities (toaster, microwave, cutlery and fridge) and complementary tea and coffee is provided. There are two chairs and a TV with DStv. 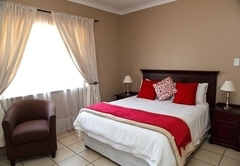 This suite sleeps 2 in a king bed or two single beds. The bathroom has a shower and a bath. 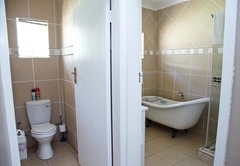 The suite has kitchen facilities (toaster, microwave, cutlery and fridge) and complementary tea and coffee is provided. There is a couch, DStv and a patio. 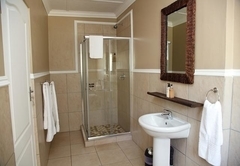 This suite sleeps 2 in a king bed and the bathroom has a shower. 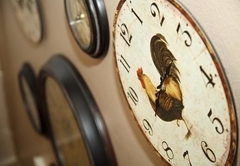 Kitchen facilities (toaster, microwave, cutlery and fridge) and complementary tea and coffee is provided. There is a couch, DStv and a patio. This unit has one king bed or two single beds. The bathroom has a shower and bath. The suite has kitchen facilities (toaster, microwave, cutlery and fridge) and complementary tea and coffee is provided. There is a lounge with a couch, DStv and a patio. 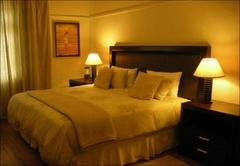 This suite sleeps 2 in a king bed or two single beds. The bathroom has a shower and bath. Kitchen facilities (toaster, microwave, cutlery and fridge) are provided. There is a lounge with a couch and DStv. 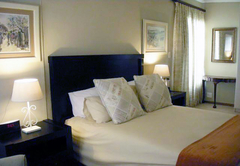 This suite sleeps 4 in 2 bedrooms. One bedroom has a king bed and the second bedroom has two single beds. The bathroom has a shower and bath. 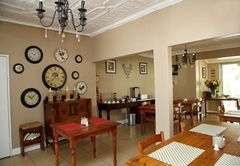 Kitchen facilities (toaster, microwave, cutlery and fridge) are provided. There is a lounge with a couch and DStv. This Family Unit has one king bed and one double bed. 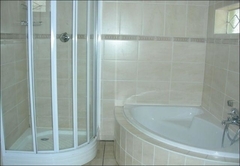 There are two bathrooms, the first has a shower bath and the second a shower and bath. 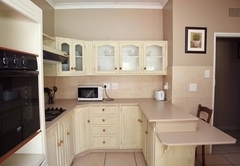 Kitchen facilities (toaster, microwave, cutlery and fridge) are provided. There is a lounge with a couch and DStv. This unit has one king bed or two single beds. The bathroom has a shower and bath. Complementary tea and coffee is provided. There is DStv and a patio. This unit has one king bed and the bathroom has a shower and bath. The suite has kitchen facilities (toaster, microwave, cutlery and fridge) and complementary tea and coffee is provided. There is a lounge with a couch, DStv and a patio. 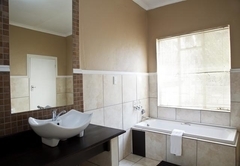 This unit has one king bed and the bathroom has a shower and bath. The suite has kitchen facilities (toaster, microwave, cutlery and fridge) and complementary tea and coffee is provided. There is a TV with DStv. I stayed here twice with my fiancee and both times fell in love with the place. 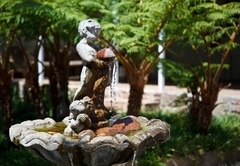 The rooms are comfortable and clean, the garden and pool are beautiful and relaxing, and the staff are very nice. 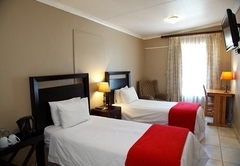 The price is very reasonable and we plan on staying there anytime we're in Johannesburg.